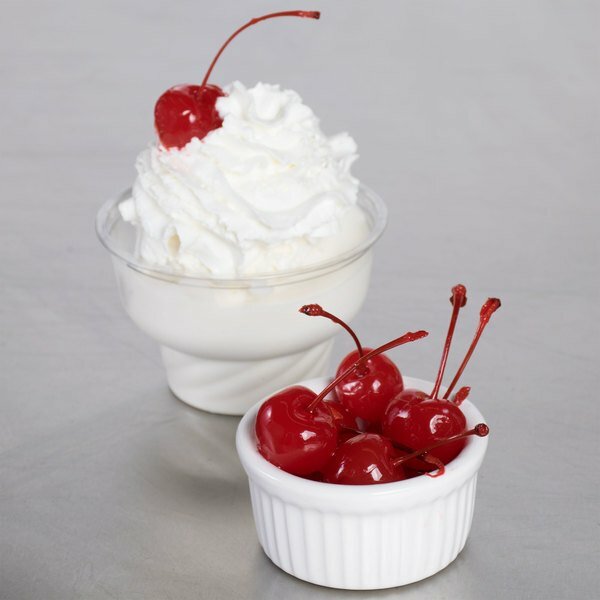 Provide guests with a timeless Maraschino cherry garnish on their cocktails and ice cream sundaes. 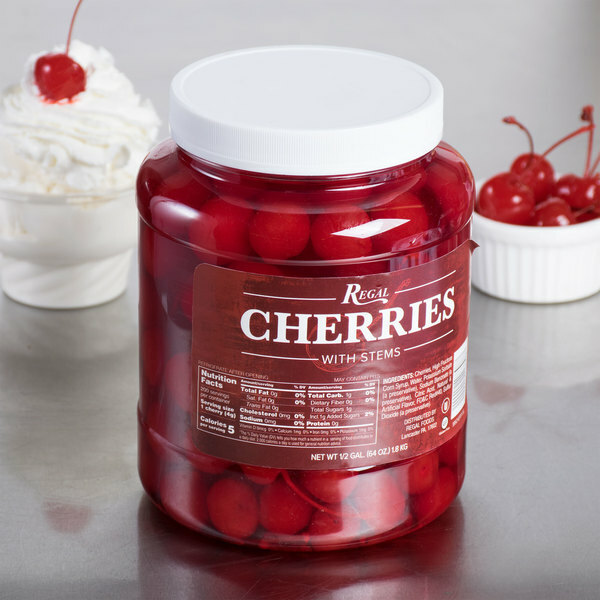 Picked at the peak of ripeness and hermetically sealed in a half gallon tub, these cherries will maintain optimum freshness for an extended period of time. The stem provides a more natural and eye-catching look, while also giving a convenient way for patrons to pluck their sweet treat from atop their cocktail or banana split. Whether you plan to give a finishing touch to delicious sundaes, dress a basic salad, or sweeten up a cocktail, these cherries are sure to brighten up your menu items. "The price for these was perfect. The product shipped quickly and arrived "sealed". 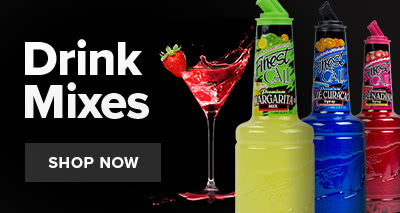 We use these in our bar for Shirley Temples and all kinds of cocktails. Will order again." This half gallon container features a tightly-sealing lid and a molded-in comfort-grip handle for easy use. 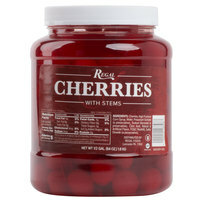 These cherries are specially selected for size and packed to provide the greatest yield possible. 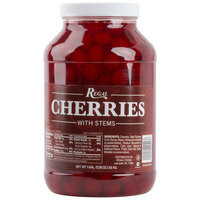 These cherries feature the sweet, crisp taste of freshly picked cherries, enhanced by specially-flavored sugar syrup. The special-formula sugar syrup also adds a brilliant red color, making it the perfect garnish for a Shirley Temple and other beverages. I couldn’t pass this up. One jar in the reg supermarket wouldn’t have been enough. This sufficed for the huge party we had. It was a great purchase . Great value and I like the convenience of this size jar versus the gallon size. Open as needed and the rest stays fresh! 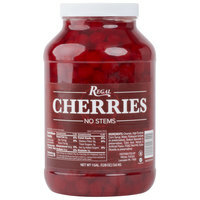 Also it says 170 Servings (cherries) but there are really a few more. Not too impressed. Won't order again. Not as sweet as I would like. They are not packed in heavy syrup. They are a good price and shipping was fast. Good selection of cherries with stems. Not many stems were missing and juice filled jar and cherries so they did not dry out. Good product and packaging. These worked perfect for the chocolate cherry cookies I made. The quality & taste was perfect I couldn’t ask for a better cherry & the price was great! Best cherries you can buy the taste exactly like the ice cream truck when i was a kid easy to take out from the wide mouth jar. These cherries are sweet and delicious. You can top a milkshake or a dessert with these. 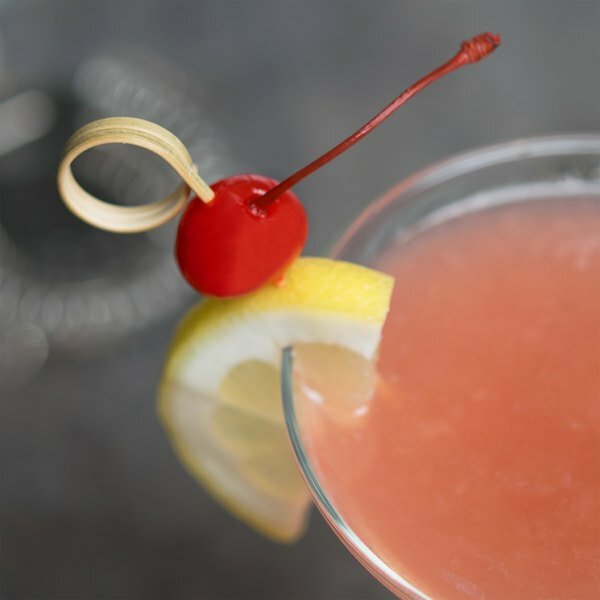 Our guests love them in our cherry Italian soda. 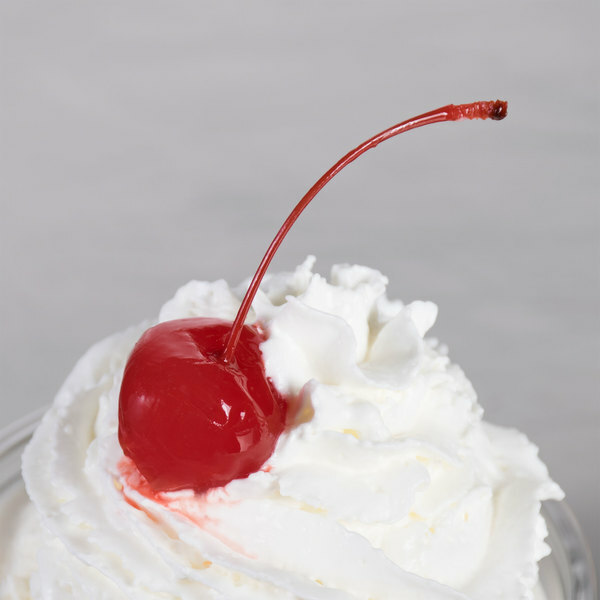 This Regal Maraschino Cherry with the stem on is perfect for topping my cupcakes and other desserts at my restaurant. I absolutely love them as they make for great presentation. Nothing really bad to say about this what I was looking for I gave it a 4 start because the juice liked out and was all love everything that was a pain. Bought and used for our wedding last weekend. Our signature drinks were Shirley Temples and Dirty Shirleys! Made it through a full night of 160 people drinking with still about 1/3 of the gallon left! These maraschino cherries are as good as the national brands available from our grocery supplier, and come in at a fraction of the cost! And the plastic container is easier to handle than the glass jars! A great buy, and a must have for most every bar! The cherries are so good! I had to hide them.in the back of the fridge jusy so everyone wouldn't eat them lol. I just got the 1/2 gallon but will for sure be getting the gallon next! 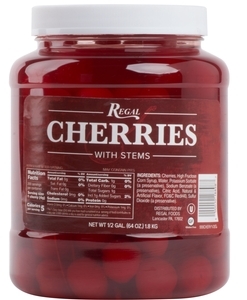 We ordered these Regal Maraschino Cherries with Stems - 1/2 Gallon for our wedding. We ran out of them but they were delicious and certainly provided a great garnish to our drinks. I love this maraschino cherries, it can be used to top ice creams and milkshakes or the stems can be removed to make cherry filling. These cherries are pretty good. They have a good cherry flavor and they're not giant boulder-sized like some cherries. 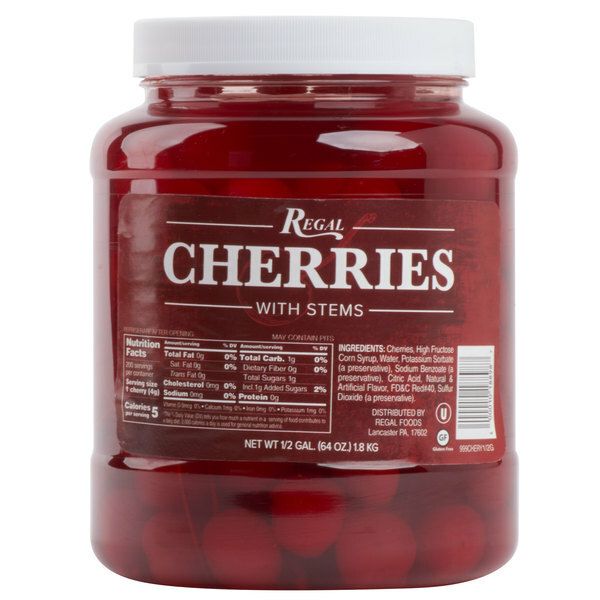 They're perfect for cherry shakes. I use them for candy making. The nice long stems make it easy to dip them in fondant and the large half gallon size ensures there's plenty on hand when you need them, simply refrigerate. used on the mamosa bar for our family reunion sweet and firm. they were a instant success. this was also a high big time. you never fail to come thru. Buy the bigger jar for a better value. Big cherries big flavor. We bought the small one to try and ended up ordering the big one. We’ve had compliments on the flavor compared to the ones we buy from the big box stores. 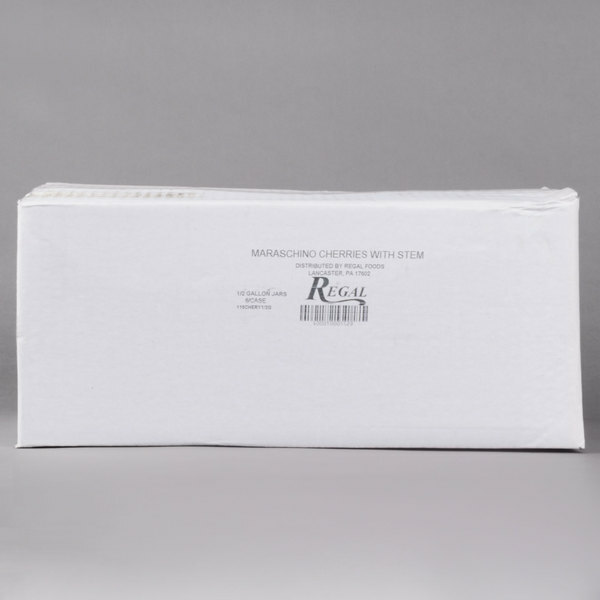 The regal maraschino cherries with stems is a really great quality product with good sturdy stems. They are perfect for our ice cream sundaes and malts. I love the large size jars as well.